Rathlin Energy Ltd has terminated its petroleum licence and withdrawn its planning application to drill a second well at Ballinlea. (See statement.) It is a wonderful outcome for all the residents who opposed the well, and all those who supported and helped their campaign. “It is with great relief that we welcome Rathlin Energy Ltd’s decision to terminate their Petroleum Licence (PL3/10) for the Rathlin Basin, and withdraw their planning application to drill an exploratory well into the shale layer at Ballinlea. The company cited a number of reasons for their decision—depressed world oil prices, unforeseeable delays in the planning approval process, and a lack of suitable conditions in Northern Ireland. Their licence was due to expire early in 2016 and they would have had to extend it in order to complete the planning process, and their drilling plans. Questions have been raised in Europe around the petroleum licencing system in Northern Ireland, which, unlike that in the rest of the UK, has not been subject to a Strategic Environmental Assessment (SEA)—and therefore offers less protection for the people of Northern Ireland. SEA is something that campaigners here will continue to lobby for before any more petroleum licences are awarded. We can only speculate about the timing of Rathlin Energy’s announcement, coming so soon, as it does, after Minister Durkan’s announcement that there would be a presumption against unconventional hydrocarbon extraction in Northern Ireland Planning Policy. Campaigners have long believed that Rathlin Energy’s explorations could lead to unconventional hydrocarbon extraction, including hydraulic fracturing (fracking) along the North Coast, and so are delighted that they have decided to terminate their licence at this time. In terms of the planning process for this application, certainly there have been delays—but these have largely resulted from a lack of comprehensive information provided by the company and their representatives to the Planning Service, in order to enable them to make a decision. The information provided with the application as been inadequate since the initial application in 2013. The Protect Our North Coast (PONC) Group is pleased that the company has decided to withdraw, particularly as they had indicated that they would “not be able to function” if they were “at odds with the local community”— Over many meetings the feelings of the community were clear and witnessed in particular by the vote in April 15 in Ballinlea Community Hall when local people unanimously passed a motion expressing their opposition, and after which PONC asked Rathlin Energy to withdraw their application. Despite the relief that Rathlin Energy has terminated its licence, the campaign will not end completely. There are other aspects of the campaign which need to continue. There is still a threat to the North Coast from at least one off-shore petroleum licence near Rathlin Island, issued by the UK Department of Energy and Climate Change—and the Northern Ireland system around petroleum licencing and planning approvals requires some improvement. 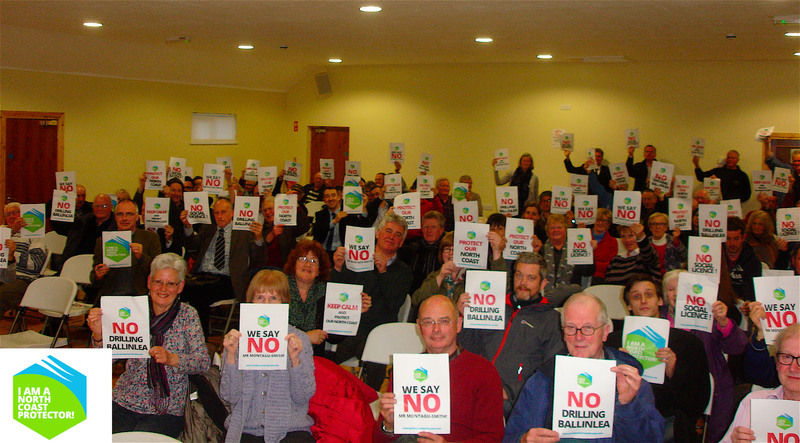 North Coast campaigners are continuing to oppose Rathlin Energy’s application to drill an exploratory well into the shale layer at Ballinlea. The Protect Our North Coast (PONC) group, composed of local Ballinlea residents and residents from the wider Rathlin Basin licence area (licence PL3/10), has been campaigning strongly against the proposal for some time now, and more information is available on the group’s website, facebook page and twitter feed (details below). The group has secured strong cross-community support among local people as well as at all levels of political representation, local and national. At a recent meeting (26th May 2015) the newly formed Causeway Coast and Glens Borough Council heard from PONC and all parties expressed support for the group’s work – they were particularly concerned to ensure the health of local people. The group has the support of local MLAs from all parties. Not only has PONC been holding public meetings to raise awareness about the proposed well, the detail of the application, and the associated Environmental Impact Assessment (EIA) and Environmental Statement (ES)…they also ran a crowdfunder, raised over £10,000, and engaged consultants to review Rathlin Energy’s EIA/ES. The consultants identified a number of inadequacies in the documentation provided by Rathlin Energy, or rather by their agents, RPS. Links to their documents are included on the PONC website. The application is still with the Strategic Planning team of the DOE at head office in Belfast, despite planning powers being devolved to the new local authorities on April 1st. No doubt the application has been retained by head office because it is complex, contentious, and of regional significance, or at the very least, because it has the potential, according to the consultants, of causing significant environmental impacts if allowed to proceed. One of the consultants even went as far as to say that approval of the application in its current form would be unlawful. The PONC group will be addressing the CCGBC again on 22nd June in a dedicated workshop on the subject. It is understood that Rathlin Energy will also be addressing the Council at that workshop, to present their different perspective on their proposals. Providence Resources UK Ltd has confirmed to DETI as of yesterday (12th August 2014), that the company has decided to relinquish its Petroleum Licence, PL5/10, which covers Rathlin Island. However, the company continues to hold a Petroleum Licence granted by the Department of Energy and Climate Change for offshore in the Rathlin Sound, posing grave risks to the coastlines of Rathlin Island, our whole north coast, and the Scottish west coast. Rathlin Energy Ltd continue to hold their onshore licence (PL3/10) for the mainland Rathlin Basin, extending from Ballycastle in the east, to Magilligan in the west, and as far inland as Garvagh. What a night! Campaigners in Belcoo were still trying to take it in at 9 o’clock tonight. The campaign has won its first battle and a halt has been put to Tamboran’s attempt to drill an exploratory well without planning permission or environmental impact assessment (EIA). All weekend, campaigners were tense, wondering what this week would bring. There was a strong feeling that, if permission was given for drilling, the rig would arrive within hours and a confrontation seemed inevitable. There were few smiles and a lot of worry. Min Durkan does the Right Thing! Minister for the Environment, Mark H Durkan, has rejected Tamboran Resources Ltd’s assertion that they could drill an exploratory borehole in a quarry in Belcoo, Fermanagh under Permitted Development Rights (PDR). “The Department of the Environment received notification from Australian Mining Company Tamboran of their intention to drill a core of rock from Cleggan Quarry, Belcoo on 21 July 2014. The company sought confirmation that this work could be carried out under current permitted development rights without the need for full planning permission as part of their ongoing exploration into the viability of extracting shale gas by means of hydraulic fracturing (fracking) in County Fermanagh. Minister Durkan stated: “I have given very careful consideration to Tamboran’s proposal to drill a core of rock from Cleggan Quarry near Belcoo and whether this is permitted development under current legislation. I have concluded that this is Environmental Impact Assessment (EIA) development requiring full planning permission and that permitted development rights do not apply. In making this assessment I have been mindful of my Department’s responsibility to ensure that the environment is protected at all times and that full consideration is give to any likely significant environmental impacts of such a proposal. “I have concerns that this is an existing quarry where unauthorised extraction has taken place. I believe there is insufficient information to establish what environmental impacts may have already arisen as a result of these unauthorised activities. Therefore, it is not possible to assess the environmental impact of the drilling cumulatively with other unknown environmental impacts of unregulated activity. Tamboran Resources were granted a Petroleum Licence by DETI in 2011 in relation to their proposals to explore the viability of extracting shale gas by means of hydraulic fracturing (fracking) in County Fermanagh. Under current planning Legislation there are certain permitted development rights under Part 16 of the Planning (General Development) Order (Northern Ireland) 1993 (as amended) in relation to Mineral Exploration including drilling boreholes. Permitted development rights do not apply to the extraction of any hydrocarbons. In considering the issue of permitted development in such cases DOE must determine whether or not the development would constitute EIA development under the Environmental Impact Assessment Regulations. If any development proposal is considered to have likely significant environmental impacts then it is development requiring full planning permission to be accompanied by an Environmental Statement and permitted development rights do not apply. If any development is deemed to be EIA development under the Planning (Environmental Impact Assessment ) Regulations 2012 then permitted development rights do not apply. DOE is considering retrospective planning applications for the unauthorised development carried out at Cleggan Quarry but is not yet in a position to finally determine them.